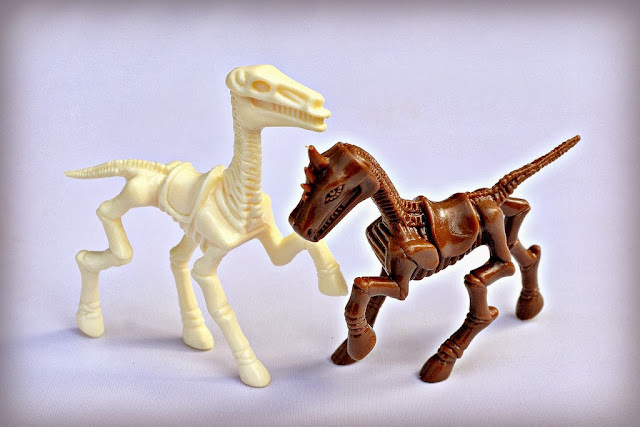 Little Weirdos: Mini figures and other monster toys: Return of the plastic skeleton fantasy warriors! Return of the plastic skeleton fantasy warriors! I did a post on these excellent guys a while back and thought it was about time for another one with better photos, especially considering I've added a bunch more of them to my collection since then. 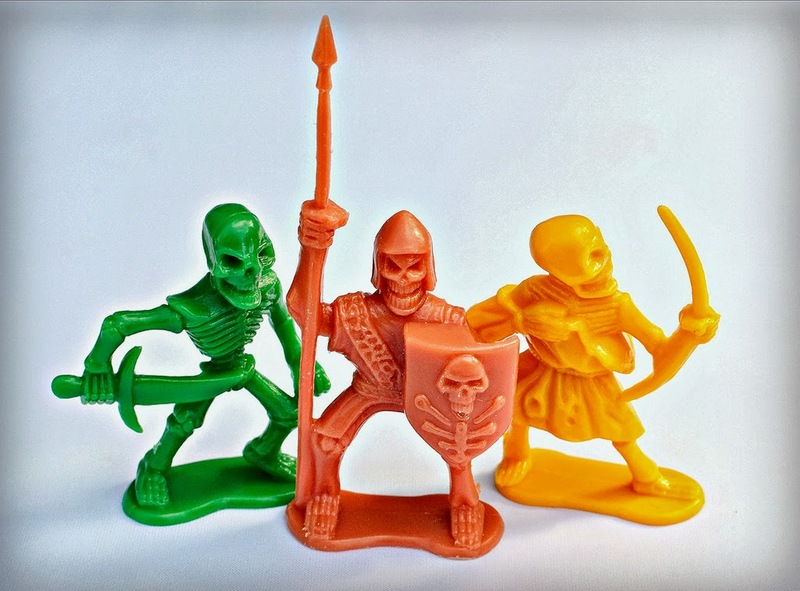 As I noted in the original post, these skeleton warriors are from fantasy-themed playsets that were available in the 1990s. The playsets didn't come under a single name, but rather a few different ones such as "Battle of the Ancients" and "Fantasy Battle." They were distributed by various companies, such as Polotoy and Schylling. Every good skeleton army needs a variety of weapons and battle attire, and these guys are representing in that area. You've got a bare-bones (bad pun intended), naked skeleton with a simple sword, a helmeted skeleton with spear and shield, and even a toga-wearing skeleton who somehow thinks he's going to do damage with a stringless bow and arrow, minus the arrow. The colors of these particular figures show off the details nicely. I especially like how expressive the skull faces are. Next up is a trio of sword-wielding skeletons in different poses. Look at those green and pink guys--they just couldn't be any happier to be in the throes of battle, could they? 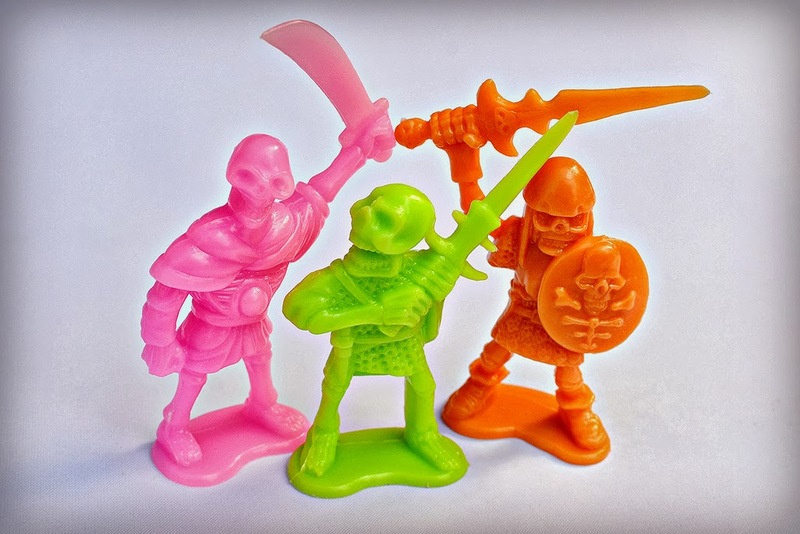 These particular ones are a good example of how the skeleton warriors came in a wide range of colors, too; while the last few shown were done in more primary, conservative colors, these guys are cheery fluorescents. The one dude is like My Little Pony-pink, which is think is pretty amazing. Here we have the big guns! And by that I mean the extra-special, extra powerful skeleton warriors of the bunch. Not only are these three a bit larger and bulkier than the six skeletons in the last two photos, they clearly have weapons and powers that make them the leaders of the pack. The one on the left appears to be some sort of witch or wizard, holding a skull in one hand and a bone that I think is supposed to double as a magical wand in the other. The other two sport some heavy duty weapons and armor. All three have pretty killer sculpts, if you ask me. As if that assortment of skeleton fighters wasn't cool enough, they also decided to throw some skeleton horses into the mix! I'd imagine these guys are supposed to serve as steeds for the warriors. Of course, you can't position the figures to ride them, but whatever. They're still welcome additions. And even though the two look very similar on first glance, they're actually unique sculpts. I like them a lot, and I'm also a fan of how the makers sort of set them apart from the warriors by making them white and brown as opposed to the bright colors of the other figures. So, that's the 11 sculpts from the set (at least all the different ones I have seen). What do you think of them? 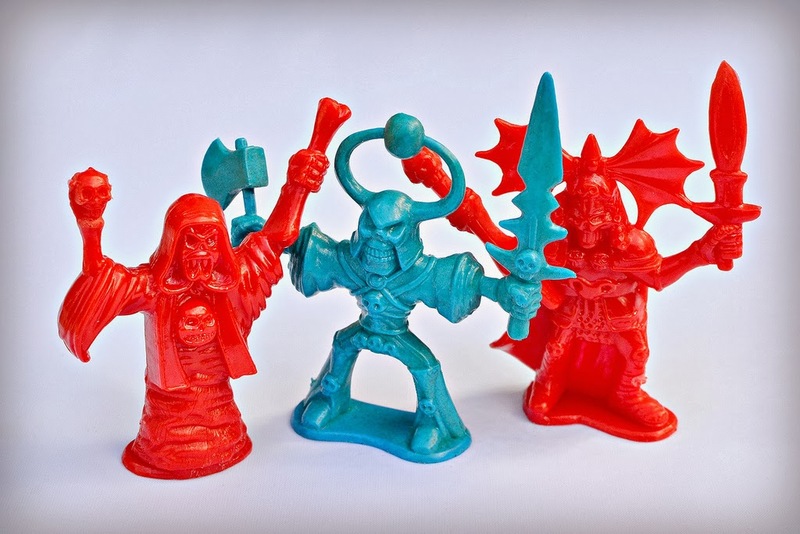 If you're a fan of early '80s fantasy mini figures such as Dragons 'n Monsters and the ones from DFC playsets like me, chances are you dig them as much as I do. I've probably said it before right here on this blog, but how can you go wrong with animated skeletons donning weapons and armor? God, I'm a geek. These skeleton figures are, I dare say, beautiful! I really want some of these, especially the horses, where did you pick these guys up? Glad I'm not the only one who would use the word "beautiful" to describe these kinds of things, haha. I got these guys through trades, but I also occasionally see some pop up on eBay. They're hard to search for though, because they don't have one specific name, and sellers don't know what to call them. I do have a few extras for trade (not the horses, but a few of the different skeleton warriors). If you have anything for trade you think might interest me and want to try to work something out, feel free to shoot me an email (you can find it in the "About" section at the top right of the site). I may have a few things you would be interested in, namely a couple MUSCLE figures and would you be interested in Z-bots?. We'll be in touch. Thank you! FYI: I sent you another email regarding another possible trade for the Skeleton Warriors. Will be back with you on that soon...thanks! I have been scouring all over the internet for these little guys. I have found a few, dug inside of lots which are not worth the pay. Are these guys, like, officially rare, or just in the wrong hands all over the world? I do not wish to trade, because I am at your mercy. I have so little direction... where do I go to acquire these beautiful, neon skeletons, or any of the soldiers from the other sets made by the same company? Well, it's hard to say whether they should qualify as rare or not, but I will say they don't seem to show up too often in my searches. It's difficult to search for them because they don't really have a specific name. Really the best way would just to be to keep an eye out on eBay with searches that describe them generally (plastic skeleton warriors, fantasy figures, etc). The two bow legged figures looked as if you can cut the base and mount them on the horses. These are wonderful.